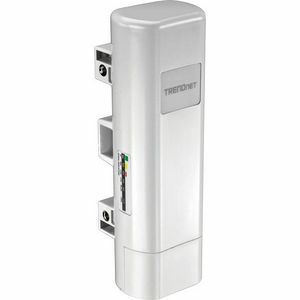 TRENDnet's 13 dBi Outdoor PoE Access Point, model TEW-734APO, provides wireless N300 (5 GHz) building to building connectivity. It supports Fat AP, Thin AP, Virtual Access Control (controls compatible Thin AP devices), and Virtual AC + Thin AP modes. Fat AP mode supports a variety of installation scenarios with Access Point (AP), WDS Bridge, WDS Repeater, Client, and CPE + AP modes. The rugged IP55 rated TEW-734APO comes with a proprietary PoE injector and a pole mounting kit. An integrated 13 dBi directional antenna, 5 GHz WiFi N300, and an included PoE injector facilitate building to building networking. Fat AP mode supports a variety of installation scenarios with Access Point (AP), WDS Bridge, WDS Repeater, Client, and CPE + AP modes. Built for protected outdoor locations with an IP55 weather rating and an operating temperature range of -20 - 70 °C (-4 - 158 °F).